As we all know, ever since LeBron James left, the only thing significant about Cleveland is Todd Kwait, a local lawyer who has turned into a quite capable documentarian on American popular music. One can't quite call him a "rockumentarian" as he has focused more on the rarely examined folk and jug-band traditions. Maybe "washboardentarian" will do. In his latest FOR THE LOVE OF THE MUSIC: THE CLUB 47 FOLK REVIVAL, co-directed with Rob Stegman, Kwait answered a question that was so obvious it had just never occurred to me. Why did folk music, of all things, captivate the eastern college-campus intelligentsia in the late 1950s? When I went to college the craze was all reggae all the time - perfectly understandable when you recognize that pot smoking came as part of the cultural baggage. Yeah, world peace, Bob Marley, almighty Jah, - blah blah blah. My university confederates, as I recall, would have listened to marathons of the Mormon Tabernacle Choir if it gave them cachet to be stoned all the time. But why folk? As Kwait explains, the inception can be traced to one club, the titular Club 47 in Boston. 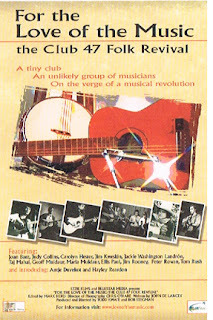 Started by young students (including future author Joyce Chopra) as coffeehouse-jazz venue, the place took a sudden turn when 17-year-old Joan Baez showed up to audition and floored everyone with her folk-traditional vocals. She was soon joined by other folk-a-holics, notably an elder-figure (by undergrad standards), the late Eric Von Schmidt, who was a walking encyclopedia of musicology; blues legend Muddy Waters; Jackie Washington Landron (whose racial harassment by Boston police became a portentious political issue); Jim Kweskin, who would spearhead the jug-band movement; and Geoff and Maria Muldaur; Judy Collins, among many others. 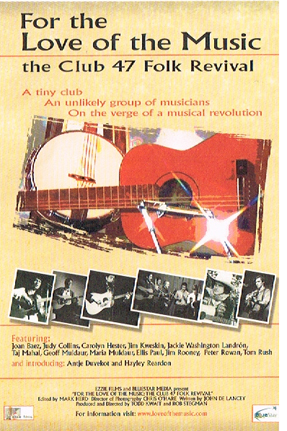 Club 47 became a magnet and a jam stage of contemporary and future music superstars, and it even cultivated eastern tastes in bluegrass and Bob Dylan's electrified folk-rock. To Jackie Washington the irony was especially sharp, that rich, privileged white kids were savoring working-poor laments, union chants and chain-gang melodies. We're told that for years the aspirations to be "authentic" folk was such that being a singer-songwriter was a bit of a taboo. Artists who wrote originals apparently would try to pass it off as some obscure traditional tune they'd unearthed. Though the filmmakers don't get Dylan on camera, protest-folk goddess Joan Baez speaks. There's a great Joan story about the Columbia Records scouts arriving to woo her away from her original label, Vanguard, with a lucrative contract. Baez refuses to sell out, sticking with the smaller, politically-tinted Vanguard. Whoah! Rewind! She refused to sell out? These days selling out to the beer companies, the made-in-China jeans companies or BATTLESHIP whore-promos is the one reason musical “artists” get into the game in the first place. What band can't wait to showcase their repertoire on Glee (I think Kings of Leon remain the only ones who have turned down the network)? Joan Baez refused to sell out. Well, it was the 1960s, and everything was strange.